Sea to Summit Comfort Light Insulated Sleeping Mat. You need a good night’s sleep if you want to get the most out of each day in the backcountry. Don’t worry – we’ve got your back. Engineered for stability, comfort, and warmth, the new Women’s Comfort Light Insulated Air Sleeping Mat has additional Thermolite® insulation (compared to the unisex model) to provide year-round warmth for women backpackers. The women’s sleeping mat shape is narrower at the shoulders, but wider between the hips and the knees. This guarantees greater comfort no matter what position you may sleep in, and perfectly matches Sea to Summit’s Women’s Sleeping Bags. 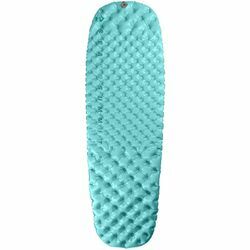 IS THIS WOMEN'S INSULATED AIR SLEEPING MAT…? Warm enough for four-season use? Yes. This air sleeping mat has a tested R-Value of 4.7 which is enough insulation for all but the coldest ground. Really comfortable despite being 2.5” thick? Yes. Thickness is not the key factor in an air sleeping mat; the number of points of suspension is. Your weight and contours rest on 324 individual air-filled springs (size Regular). Easy to inflate? Yes! The supplied stuff sack features an integrated Airstream Pump – just a couple of breaths will inflate the air sleeping mat. No dizziness for you, and practically no condensation moisture inside the air sleeping mat. Genius! Comfort & Support - 324 individual Air Sprung Cells™. These small interconnected chambers support your weight and conform to your body, similar to a spring mattress. Women's Specific Sleeping Mat Shape - Narrower in the shoulders, wider between the hips and knees. Offers greater comfort no matter what position you sleep in and perfectly matches the shape of our Women's Sleeping Bags. R-Value of 4.7 is warm enough for all but the coldest ground. Exkin Platinum® fabric and THERMOLITE® insulation are combined to prevent heat loss. All women's mats feature a thicker insulation layer. Hybrid-Layer Air Sprung Cells provide more support and insulation in the torso area as well as excellent comfort. Quick and easy inflation, deflation and adjustment made possible by patent-pending multi-function valve and supplied Airstream Pump™/stuff sack. Tough 30D / 40D face fabric with Sea to Summit’s liquid-extruded lamination is quiet, durable and extremely reliable. PillowLock™ system to preventing your Aeros™ Pillow slipping.